Over the past year in the course of researching my own book I’ve been inspired to transition from vegetarian to a completely whole foods plant-based diet. Life just keeps getting better. 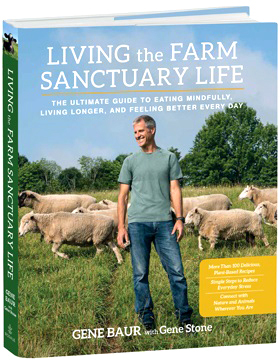 Luckily for me and for everyone looking to live a saner, more humane life, Gene Baur is releasing his second book: Living The Farm Sanctuary Life: The Ultimate Guide To Eating Mindfully, Living Longer, And Feeling Better Every Day. 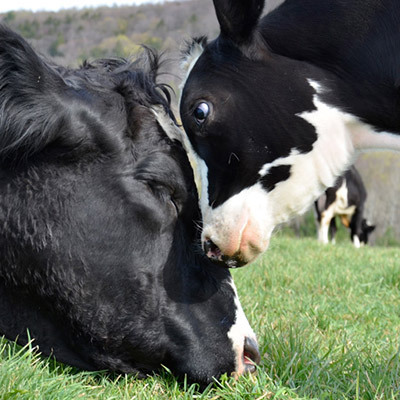 Gene Baur is the co-founder of Farm Sanctuary, a tranquil oasis for rescued farm animals and the people who love them. 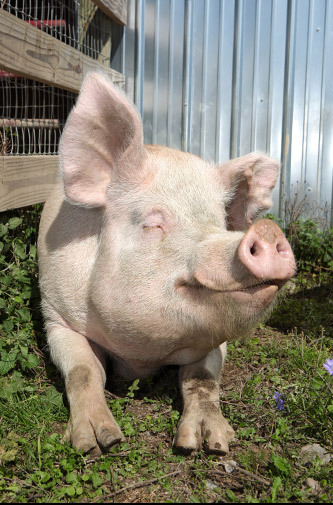 Farm Sanctuary encourages a lifestyle that is mindful of animals and promotes harmonious and peaceful living. With the help of Gene Stone, author of Forks Over Knives, Gene has managed to turn the Farm Sanctuary experience into a book ripe for people of all types. Living The Farm Sanctuary Life pushes us in a direction that betters the lives of those around us; both human and nonhuman alike. Gene and Gene have developed guides to teach us about animal friendly living and getting the most out of a plant-based diet. They have paired their knowledge with delicious recipes, outlined ways to achieve physical and emotional health, focused on product choices and shopping habits, and discussed how to decide which products benefit our world and which do not. This is a book for everybody; from a beginner transitioning to a meatless diet, to the seasoned vegan veteran. Gene took the time to answer some of our questions about plant-based diets and helped us to form a clear understanding of how they truly improve our health, our environment, and the creatures we share it with. How does a plant-based diet benefit our physical and mental health? GENE: Biologically, humans are best suited to eating plant foods, which provide everything we need to live well and thrive. Consuming animal products, especially in the quantities we do in the U.S., contributes to heart disease and other preventable health problems. Experts estimate that we could save 70% on health care costs by shifting to a whole foods plant based diet. Eating animals also affects our emotional well-being. Slaughtering animals for food is violent and bloody, and requires us to lose part of our empathy, which negatively affects how we relate to other animals and people. Kindness to animals is good for animals, and it’s also good for humans. How does vegan living help OUR ENVIRONMENT AND OUR WORLD? GENE: Raising animals for food squanders and pollutes vast quantities of precious natural resources, and contributes to our planet’s most serious environmental problems. By choosing plant foods, we can significantly lighten our environmental footprint. Eating plants directly requires less land, water and other inputs, and is roughly ten times more efficient than feeding plants to animals who are raised for slaughter. If I cut all animal produce out of my diet how will I feel different? GENE: People feel lighter and have more energy when they cut animal products out of their diets. Meat and other animal foods are devoid of fiber, and can take days to pass through our intestinal tracts, bogging us down. And, most people are uncomfortable with how farm animals are mistreated on factory farms, so freeing ourselves from the cruelty of that system also feels good emotionally. If we can live well without causing unnecessary harm, why wouldn’t we? What is your first tip for anyone considering a vegan lifestyle? GENE: My first tip is to remind people that they are already eating many vegan foods (eg. fruits, vegetables, beans, grains, nuts, mushrooms), and that many non-vegan foods can easily be made vegan, such as breakfast cereal with non-dairy milk instead of cows’ milk. Being vegan isn’t that hard!